The building formerly known as Teron, 251 Laurier Avenue West. Image: July 2016. In the same way that Ottawa grew out during the 1950s and 1960s, it also grew up. The names were even the same: Robert Campeau, Garfield Weston, Ken Greene, and of course, Bill “Mr. Kanata” Teron. The Teron Building, located on the northeast corner of Laurier and O’Connor was Teron’s second office building in Ottawa and, at the time of construction, his tallest. Until 1897, the lot at the northeast corner of Laurier Avenue West1Until 1904 it was known as Maria Street, and its counterpart east of the Rideau Canal was known as Theodore. Proposal for the change was introduced by Alderman Lewis in 1901, the prospect gained in popularity, and in 1904, Ottawa was introduced to Laurier Avenues West and East. See “Chief Powell Reinstated,” Ottawa Journal, September 14, 1901, p. 6; “Maria Is Glad To Change Her Name,” Ottawa Journal, October 26, 1903, p. 3; “More Money is Wanted,” Ottawa Journal, January 8, 1904, p. 1. and O’Connor was empty, awaiting development. In 1897, a three-storey, four-unit row was constructed to house a number of families, including that of James E. Hanna, a local surgeon.21897/98 Ottawa City Directory. In spite of mounting pressures surrounding it, the role played by the row did not significantly change through its time: the two units furthest from the corner (237, 239) remained single dwellings, one in from the corner was divided (241, 241½), and the corner unit, which had at first been Hanna’s surgery, was eventually converted to a rooming house. Its neighbour to the east at 227, an iteration of the Rideau Winter Club, did however.3Plenty of great work has been done on the history and heritage of the building. Robert Smythe captured it in his work on the Rideau Curling Club. Charles Akben-Marchand wrote extensively of the history of the block while it was being cleared for the construction of the Export Development Canada building. See “Down, Down, Down,” “Down, Down, Down Update 1,” “Down, Down, Down Update 2,” “Down, Down, Down Conclusion,” “Piles of Fun 1,” “Piles of Fun 2,” and “Piles of Fun 3.” Charles’ posts give us a glimpse of the exterior cladding Bill Teron selected at construction. 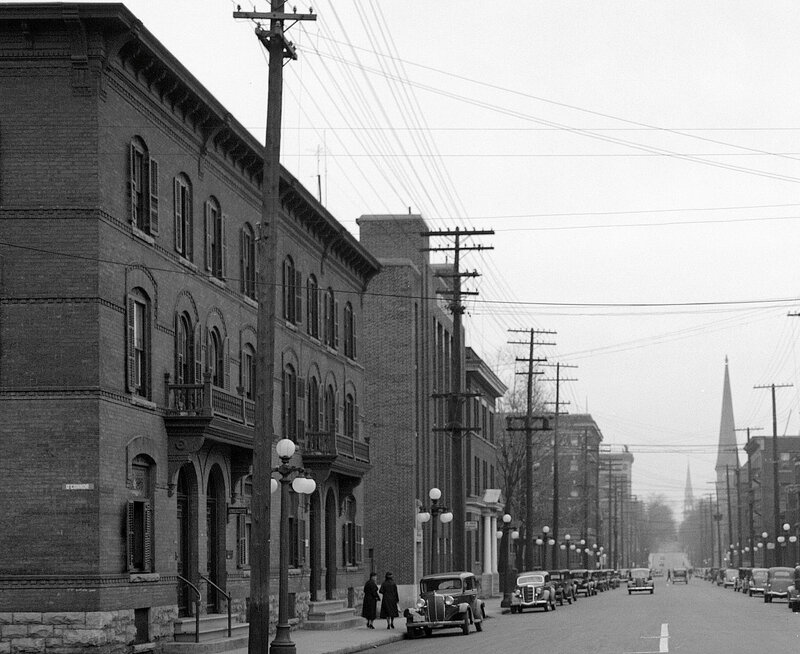 Laurier, looking east at O’Connor, 1938. Image: Library and Archives Canada. Hanna’s row graced the corner of Laurier and O’Connor right up until 1955, when the lot was purchased and row demolished by Maple Leaf Realties.4The building had been frequently bought and sold by a number of investors over the years. At one point or another, it had been in the possession of William D. Morris, Harold G. Vail, Abraham Heaps, and Robert G. Hill. When Maple Leaf purchased it in 1955, the sellers were Joseph Ginsberg and Leon Gluzman and the cost was $62,000. See Ottawa Land Registry Office, Plan 3922, Pt. Lots 44, 45, North Laurier, Reel 4AR-118. While deciding what to do with the lot, Maple Leaf (which had also purchased and renovated the Rideau Winter Club in 1949), leased the space to Charles Imbro who operated it as the Capital Parking Lot.5Might’s Directory of Greater Ottawa, 1960. Imbro was best known as the co-owner of Imbro’s Restaurant, located at 415 Rideau. Up to its demolition, the end unit (243) had been serving as a rooming house run by Harvey and Norma Bourgeois: not exactly a desired or valuable use of land in what was quickly becoming Ottawa’s extended downtown core.6In Might’s Directory 1955, the row was occupied by Maurice & Emma Rose, Edith Sage, and Alex Hill (237), Cornelius and Emma Thiessen (239), Mrs. Jean Lamb (241), Gerald and Alma McDonald (241½), and Harvey and Norma Bourgeois’ rooming house (243). Between 1956 and 1960, Charles Imbro’s Capital Parking Lot occupied the corner. Image: geoOttawa, 1958. If nobody had heard of him in 1955, by 1960 Bill Teron had become a household name in Ottawa. As the developer of Lynwood Village in Bell’s Corners (the largest of his projects to that point), the young gun was poised to rise to any challenge in development.7He was 25 when he announced Lynwood and 27 when the Teron Building went up. See “‘Design Knows No Cost’ If Home Well Planned,” Ottawa Citizen, May 6, 1958, Home and Garden Insert, p. 6; James Purdie. “$20 Million Green Belt Community,” Ottawa Journal, October 10, 1958, p. 1; “Housing Project for Graham Farm,” Ottawa Journal, October 20, 1960, p. 1. While he never did lose focus on the construction of suburban single family housing, he did decide to try his hand at the construction of office buildings in 1960. 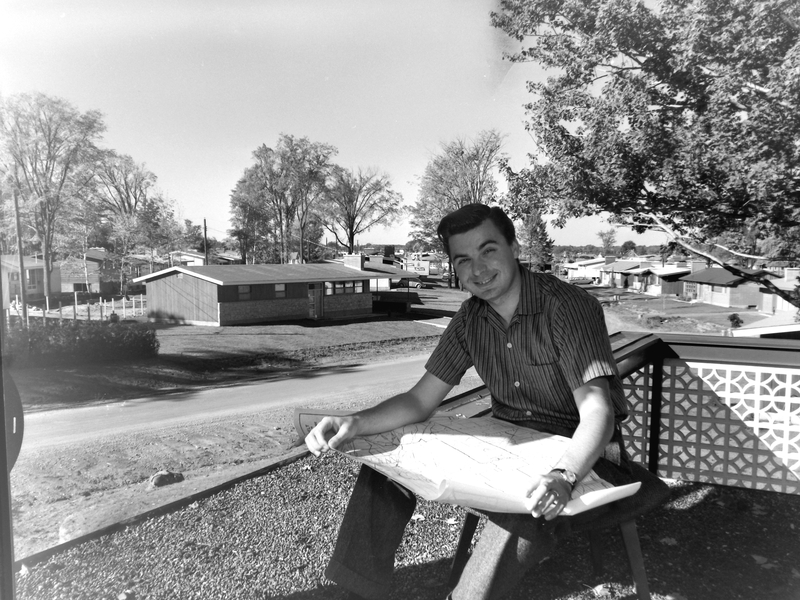 Teron, as photographed by Ted Grant on September 25, 1959. Image: Ted Grant / LAC Accession 1981-181 NPC Series 59-0323. 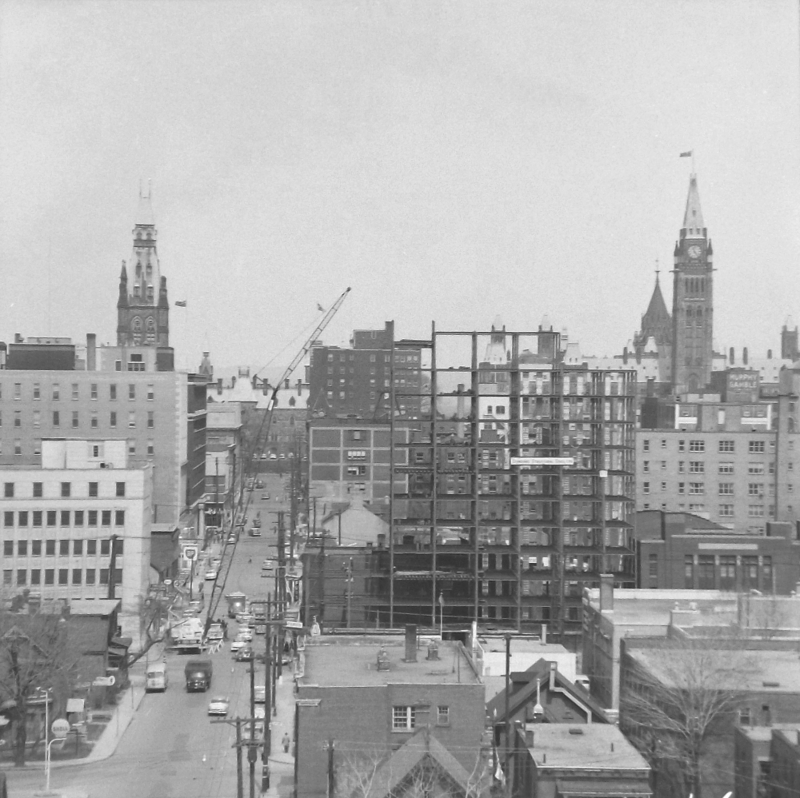 In November 1960, just as ground was being broken, the Ottawa Journal announced that Teron had rented out all 11 floors of the building he was currently constructing at the corner of Laurier and O’Connor. The main tenant in his $1.5 million building was Bell Canada, whose exchange was nearby and had rented out seven of the building’s floors.8”Teron Plans $1,000,000 Structure,” Ottawa Journal, November 23, 1960, p. 19. Teron had three offices under construction at the time and it was the most expensive of them.9The others were a $1 million elsewhere in the uptown/midtown and a $500,000 office on Argyle, between Bank and O’Connor. See “Construction Boom Foreseen,” Ottawa Journal, December 17, 1960, p. 44. The piling for the building had been completed by the winter of 1961 and the steel for the project was expected to arrive soon.10Charles Lynch. “Real Estate: Lynwood Village at Bell’s Corners Growing Community,” Ottawa Journal, February 11, 1961, p. 28. April 1961. Image: Ted Grant / LAC Accession 1981-181 NPC File 61-1304 Photo 4. When the Teron Building was first announced, it was to be six storeys in height and come in at a cost of $750,000.11W.M. Arnott. “New Buildings Going Up Fast,” Ottawa Journal, October 5, 1960, p. 1. Just one month into the process, Teron had expanded the plan considerably, to eleven storeys and $1.5 million.12”11-Storey Building On O’Connor,” Ottawa Journal, November 10, 1960, p. 5. The height and the value of the building was not really what was interesting about the development, however. On October 5, 1960, W.M. Arnott of the Citizen reported that it was going to be constructed using “new building techniques,” which were “never attempted before in Canada.”13Arnott, Citizen, p. 1. Teron Building, under construction in May 1961. Image: National Film Board / LAC Accession 1971-271 NPC Box TCS 01186 Item K-5626. Teron Building, under construction in May 1961. Image: National Film Board / LAC Accession 1971-271 NPC Box TCS 01186 Item K-5627. Teron Building under construction, May 1961. Image: National Film Board / LAC Accession 1971-271 NPC Box TCS 01186 Item K-5628. ‘The outside shell will be of pre-fabricated concrete,’ he said. “It will go up in 60-foot lengths, two and a half feet wide, the whole height of the building,” he said. In the winter months builders have to fight weather conditions, he commented. Teron Builders propose to meet these conditions by pre-fabrication of all the building elements. ‘Basements as such are out,’ he said. ‘What happens is that construction work usually starts with a big hole and a lot of time wasted putting in foundations. We will pile from the ground up and locate all our services, including heating equipment and elevators, on the top floor. Everything that can be cone to expedite winter building will be done. '”15Arnott, Citizen, p. 1. As noted above, the piling had been completed by that February. April 1961. Image: Ted Grant / LAC Accession 1981-181 NPC File 61-1304 Photo 6. Precast was the wave of the future and Teron was right there on the knife edge, at least among local developers. The techniques were also used in the construction of Teron’s building at 219 Argyle, between O’Connor and Bank. Unlike its contemporary on Laurier, the Teron Building on Argyle has retained its distinct midcentury charm and is one of my favourite smaller neighbourhood offices. Teron used the same techniques for the office building on Argyle. Source: Ottawa Citizen, February 15, 1961, p. 3. The Teron Building was not, of course, the only new office to begin Ottawa’s reach skyward during those years. 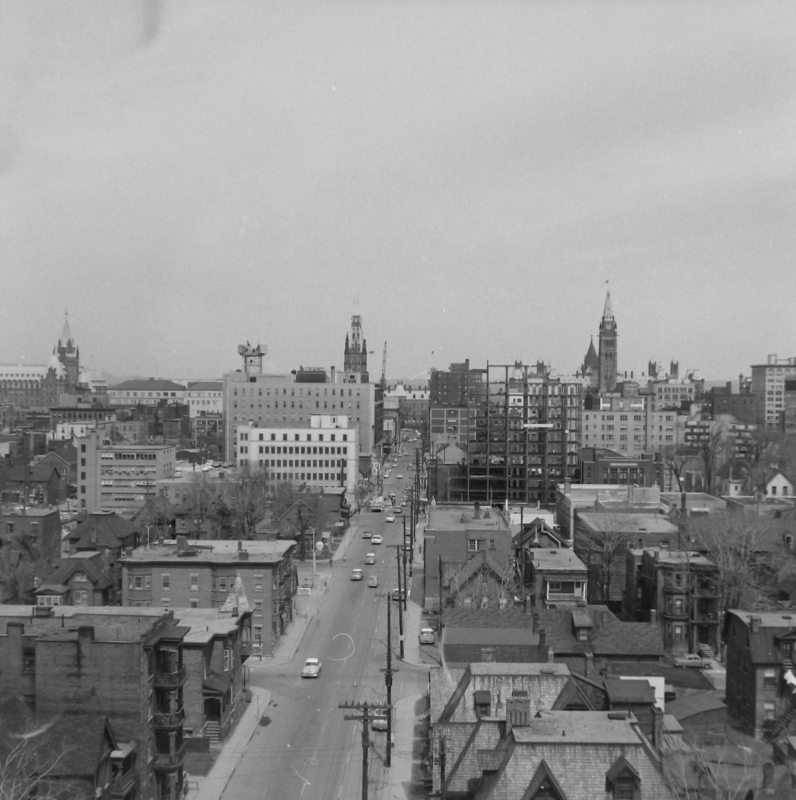 In 1961, the Capital looked upward. The new Royal Bank branch on Sparks, the Sir Alexander Campbell Building at Confederation Heights, Rideau Terrace, and the Teron Building all went up that Spring. Source: Ottawa Journal, July 19, 1961, p. 21. 1. ↥ Until 1904 it was known as Maria Street, and its counterpart east of the Rideau Canal was known as Theodore. Proposal for the change was introduced by Alderman Lewis in 1901, the prospect gained in popularity, and in 1904, Ottawa was introduced to Laurier Avenues West and East. See “Chief Powell Reinstated,” Ottawa Journal, September 14, 1901, p. 6; “Maria Is Glad To Change Her Name,” Ottawa Journal, October 26, 1903, p. 3; “More Money is Wanted,” Ottawa Journal, January 8, 1904, p. 1. 2. ↥ 1897/98 Ottawa City Directory. 3. ↥ Plenty of great work has been done on the history and heritage of the building. Robert Smythe captured it in his work on the Rideau Curling Club. Charles Akben-Marchand wrote extensively of the history of the block while it was being cleared for the construction of the Export Development Canada building. See “Down, Down, Down,” “Down, Down, Down Update 1,” “Down, Down, Down Update 2,” “Down, Down, Down Conclusion,” “Piles of Fun 1,” “Piles of Fun 2,” and “Piles of Fun 3.” Charles’ posts give us a glimpse of the exterior cladding Bill Teron selected at construction. 4. ↥ The building had been frequently bought and sold by a number of investors over the years. At one point or another, it had been in the possession of William D. Morris, Harold G. Vail, Abraham Heaps, and Robert G. Hill. When Maple Leaf purchased it in 1955, the sellers were Joseph Ginsberg and Leon Gluzman and the cost was $62,000. See Ottawa Land Registry Office, Plan 3922, Pt. Lots 44, 45, North Laurier, Reel 4AR-118. 5. ↥ Might’s Directory of Greater Ottawa, 1960. Imbro was best known as the co-owner of Imbro’s Restaurant, located at 415 Rideau. 6. ↥ In Might’s Directory 1955, the row was occupied by Maurice & Emma Rose, Edith Sage, and Alex Hill (237), Cornelius and Emma Thiessen (239), Mrs. Jean Lamb (241), Gerald and Alma McDonald (241½), and Harvey and Norma Bourgeois’ rooming house (243). 7. ↥ He was 25 when he announced Lynwood and 27 when the Teron Building went up. See “‘Design Knows No Cost’ If Home Well Planned,” Ottawa Citizen, May 6, 1958, Home and Garden Insert, p. 6; James Purdie. “$20 Million Green Belt Community,” Ottawa Journal, October 10, 1958, p. 1; “Housing Project for Graham Farm,” Ottawa Journal, October 20, 1960, p. 1. 8. ↥ ”Teron Plans $1,000,000 Structure,” Ottawa Journal, November 23, 1960, p. 19. 9. ↥ The others were a $1 million elsewhere in the uptown/midtown and a $500,000 office on Argyle, between Bank and O’Connor. See “Construction Boom Foreseen,” Ottawa Journal, December 17, 1960, p. 44. 10. ↥ Charles Lynch. “Real Estate: Lynwood Village at Bell’s Corners Growing Community,” Ottawa Journal, February 11, 1961, p. 28. 11. ↥ W.M. Arnott. 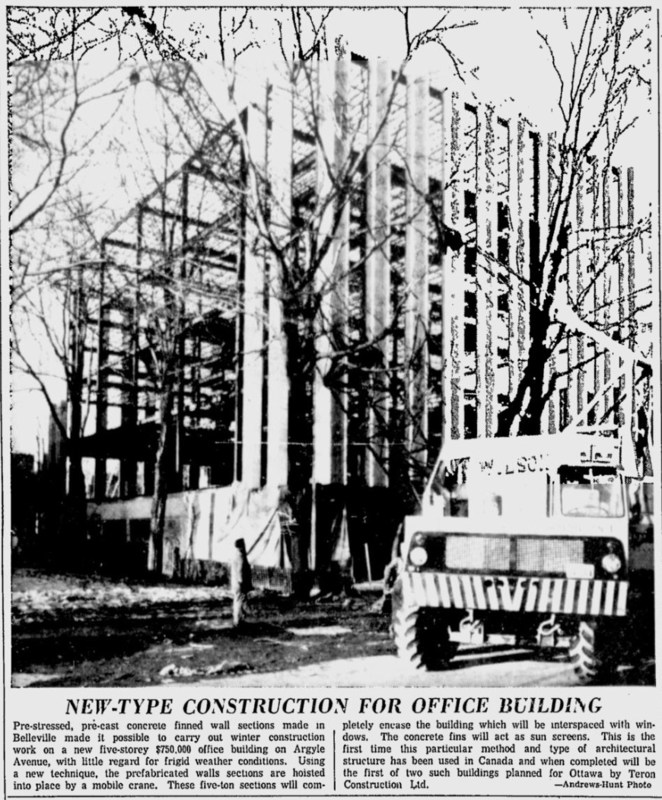 “New Buildings Going Up Fast,” Ottawa Journal, October 5, 1960, p. 1. 12. 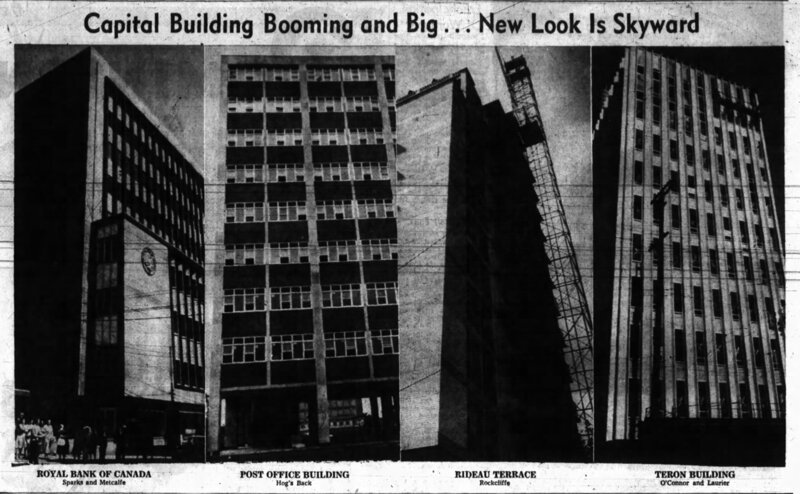 ↥ ”11-Storey Building On O’Connor,” Ottawa Journal, November 10, 1960, p. 5. 13. ↥ Arnott, Citizen, p. 1. 14. ↥ By the foregoing standards in Ottawa. 15. ↥ Arnott, Citizen, p. 1.